The Many Stars of the Heavens … Are Young? In my unofficial rivalry with a high school student, it looks like I’m finally getting a post up before him about the latest from Brian Thomas and the Institute for Creation Research’s “Daily Science Updates.” Though it’s really an unfair challenge because he’s in a land Down Under and wakes up about the same time that these suckers go up on the ICR’s website. I’m supposed to be in bed. Stars are important. Perhaps that much should be obvious to everyone. In the current epoch of the universe, stars are what provide energy to allow some minor things like, say, life to exist. Stars are formed generally with a set amount of gases, and the vast majority of this gas is hydrogen. In the core of stars – roughly the inner 10% in a sun-like star – temperatures and pressures are high enough for fusion to occur which is what provides energy. It also prevents the stars from collapsing. Stars are a balancing between outward pressure from heat and energy versus the collapsing force of gravity. Gravity compresses the gas until fusion begins and counters it. In small stars, there is less force of gravity, and so the pressures and temperatures are lower and fusion goes on more slowly. In large stars, there is a larger force from gravity, the pressures and temperatures are much higher, and fusion goes on at a much faster rate and over a larger portion of the star in order to prevent collapse. This means that even though smaller stars – say, red dwarfs – are significantly lighter than the sun, they will be able to continue to fuse hydrogen for roughly 10 trillion years as opposed to the sun which has an estimated lifetime of 10 billion years. Contrast that with the gigantic stars – blue supergiants – which are generally up to about 50 times the mass of the sun, and these will go through their nuclear fuel in roughly 10 million years. In each of these (red dwarfs, yellow dwarfs like the sun, blue supergiants), we’re dealing with a factor of one thousand difference in expected lifetime because of the different pace of fusion. Surrounding our galaxy, there are roughly 175 known groups of stars called globular clusters. These are tight groupings of many hundreds of thousands to millions of stars that generally all formed at once (astronomically speaking) and lack any interstellar material from which to form new stars. There are different ideas for how these originated – some think they were just clouds of gas that collapsed into dense clusters of stars, similar to open clusters, while others think they may be the cores of small dwarf galaxies that were consumed by our galaxy. What’s known is that effectively every globular cluster surrounding our galaxy is very old, on the order of 10 billion years. In fact, before we had good models of stellar evolution, there was a disconnect in cosmology where we thought globular clusters were older than the universe (obviously that could not be true). It’s important to note in a post about this particular subject that these have since been reconciled both by better estimates for the universe’s age and better stellar models. The point is that globulars around our galaxy are old (many around Andromeda are young, but this post is not about them). The problem is that most globular clusters contain a few blue supergiant stars known as “blue stragglers.” These are, well, blue supergiant stars. Given what I said above, these should not exist in an old star cluster because they should have exploded 10 billion minus 10 million years ago. The same can be said about some open clusters in our galaxy, except that open clusters are usually young and they contain fewer members. Open clusters usually form within the plane of the galaxy, and over the course of a few hundred thousand to hundred million years, the member stars disperse due to interactions with other stars. So, most are young and most happily contain blue supergiant stars that are no problem for stellar evolution models. There are a few exceptions, and one of them is discussed in the article that’s the subject of this post. NGC 188 is well above the plane of the galaxy, so it has managed to stay together for about 7 billion years. All the members formed at about the same time, except that it contains some of those blue stragglers. So again, we have a question that needs answering: How do you get stars that are supposed to have lifetimes at 10 million years in a cluster that’s 7 billion years old? Enter Brian Thomas and the Young-Earth Creationists to the Rescue! Mr. Thomas’ article is responding to a recent Nature paper entitled, “A mass transfer origin for blue stragglers in NGC 188 as revealed by half-solar-mass companions.” With the wonders of the internet, you can read the paper yourself for free here (it’s short, but it’s pretty technical). Now, to start off with, when I was an undergraduate just a very very few short years ago, because I’m not old, we were taught that the likely explanation for blue stragglers was that they were a second generation of stars within open clusters. 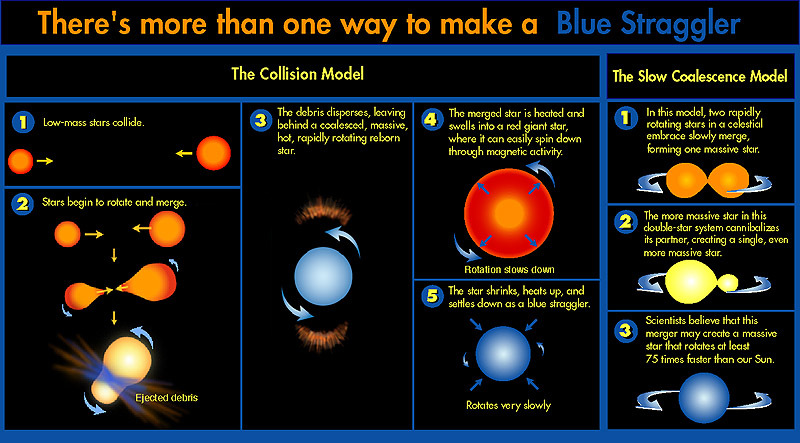 These days, it appears as though the most promising explanations are either a collision between two stars that produces a massive enough result to make a blue supergiant, and/or a star in a close binary system that siphons off material from a companion to give it enough mass to turn into a blue supergiant. This paper, in particular, that Thomas references was looking at the latter explanation. Through their observations, they have statistically ruled out the merger as the likely explanation and settle on mass transfer as the more likely of the two. They end their paper by saying mergers of triplets may happen, though. Remember: Clusters are dense and so binary and trinary systems are not uncommon. I’m not actually sure where Thomas is coming from here. By definition, blue stragglers kinda need to be a member of a cluster of stars because otherwise they wouldn’t be blue stragglers. The reason we know they “shouldn’t” be so young is that we need a cluster that all formed at the same time from which to say, “Oh, every star in here formed at the same time, the bulk age is 5 billion years, therefore giant massive blue stars are out of place.” Perhaps Peter can provide context for this. At some point in skepticism and debunking, we simply have to ask, “Show your work/math.” Brian, show your math here. How did you calculate what are “reasonable odds?” We’re talking about a cluster with over 10,000 stars in a tightly confined space. Brian is presenting a specific, statistical claim. He needs to back it up with data before it’s even worth going into further. It’s like me saying it’s mathematically impossible for 100 billion trees to exist on this planet. Okay, fine, but before anyone should accept that or take my word for it, they should demand to see evidence. I find it interesting when young-Earth creationists use star ages to argue for a creation only a few thousand years ago. The whole “problem” with blue stragglers is that they are in a system that is otherwise dated to be several billion years old. And yet creationists don’t address that big, glaring contradiction to their “model.” Or in discussing supernovae and why there appear to be “too few” of them for the age of the galaxy (let alone universe), they miss the entire fact that supernovae occur at the end of a massive star’s death which takes at least 10 million (not thousand) years to happen. Or that there exist neutron stars and black holes, which are the remnants from these explosions which would have again taken at least 10 million years to happen. Or that there exist white dwarfs, which are the remnants from a sun-like star at the end of its life, and yet that takes several billion years to form. At that point, for creationists, they must simply revert to God as Loki, the Norse trickster god. God made everything with the appearance of age to trick us. That’s not the kind of god that I think deserves to be worshiped. Nor, actually, do I quite understand why an omnipotent being has such a personality insecurity and low self-esteem to need to be worshiped. But I digress from astronomy here. Why and how blue stragglers exist is an open question in modern astrophysics. It’s an interesting question, and it’s one that may not have a single answer. The latest paper seems to indicate that at least in this cluster, binary collisions are not the likely formation mechanism. It may be elsewhere. It could be trinary. It could be mass siphoning. We don’t know. But never should we revert to and replace “we don’t know” with “goddidit.” That simply stops science in its tracks and leaves willful ignorance in its wake. This entry is in specific response to the “Where Have All the Remnants Gone?” article from Creation Science Evangelism, though it is espoused in other creation literature. There is a young-Earth creationism argument that goes as follows: Stars that are much more massive than the Sun end their lives by exploding their outer layers into space in a process called a “supernova.” These outer layers of stellar debris are heated and lit up by the energy from the supernova event. The claim then goes that there is a certain expected rate of these (this particular article claims 1 every 25 years in our Milky Way galaxy). Then, if you take the number of observed remnants (around 200) and multiply by the rate of occurrence, you get an age of our galaxy of around 5000 years. Seems pretty bad for a 13.7-billion-year-old Universe, right? Well sure it does when you’re fed half-truths. The real story is a little more complicated, though I’m going to work a little backwards through this problem. First, almost no astronomer says that a supernova should occur in our galaxy once every 25 years. Rather, the canonical number is about 1 every 100 years (in fact, this was featured in an episode of Star Trek Voyager, “The Q and the Gray”). Revisions over the past few years have pinned it down more at once every 50 years. So now, if we do straight multiplication, we have about 50 * 200 = 10,000 years. Isn’t that exactly what creationists say (more or less) the age of the Universe should be? Yep, but there’s more. We cannot observe supernova remnants across our entire galaxy – basically nebulae. Supernova events we can see across the visible universe, but the actual gaseous remnants are much fainter because they are more diffuse. Because of dust and gas in the way, we cannot see all the objects in our own Galaxy. Probably the farthest we can see into the galaxy is maybe to a distance of 10,000 light-years. The galaxy is about 100,000 light-years across. Doing a simple calculation of the area of a disk 10,000 light-years vs. 100,000 light-years (but 50,000 light-years in radius) yields an area of our galaxy about 25 times larger that we can NOT survey for supernova remnants vs. what we can. So now, we need to multiply our 10,000 years by 25, giving us 250,000 years for the age of the galaxy. The next part is that supernova remnants don’t just form out of nothing, they form from the explosions of dying stars. The stars that live and die the fastest still take about 10,000,000 years before they “go nova” and release a cloud of debris that will later become what we observe. That’s pretty much the minimum time a star can “live” during the current epoch of the Universe. Only after that will we see a supernova form. So, add that to our estimate of the age by the number of stars and we have 10,250,000 years, or 10.25 million years for the age of the galaxy. You should note at this point I’ve been saying “age of the galaxy.” That’s because this would only be used to date our galaxy, not the Universe as a whole. So you need to add in the time for galaxy formation … which is still a number that’s hotly debated, but no respected astronomer will say happens instantaneously. BUT, there’s another complication to this situation which shows why this apparent “method” for dating our galaxy isn’t valid: Supernova remnants fade! They only are visible for a few tens of thousands of years. What does this mean for our estimate of 1,000,000 years for the age of our galaxy? Well, by the time the “oldest” supernova is fading, we starting to observe supernova 200! We should only expect to see in the neighborhood of a few hundred supernova remnants in our vicinity, regardless of how old our galaxy actually is. Do You Like This Blog?